3" x 1.5" engraved name badge for PTA members. Order your new name tags for your next PTA event today! ADA Sign Vertical 20" x 3"
All across the U.S. multiple PTA chapters try their hardest to offer local students the best when it comes to their education. While multiple PTA chapters do this for kids around the country, don’t forget to do the same for all of your special PTA volunteers! Perfectly designed to your specifications, these 1.5" x 3" PTA Large Oval Engraved Name Tag are precisely what your resident PTA chapter needs! We’re so happy that you decide to order your PTA name badges from our humble factories here at Name Tag Wizard! Like you, we dedicate ourselves to giving our customers and clients the very best customer service that we can manage. Order your new name tags for your next PTA event today! 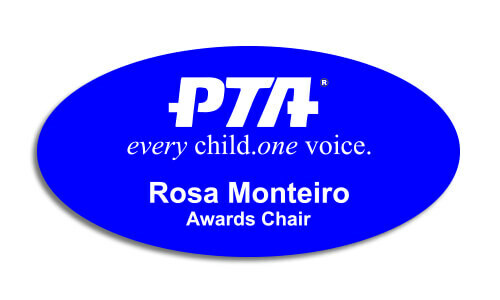 3" x 1.5" engraved name badge for PTA members.